Genie Ricafrente from California was the winner of two $20 telephone cards from Route K-OK KDDI. She has lived on Okinawa two and half years. Read More! Okinawa Nishihara Marine Park is the venue for this Saturday’s Music Day Carnival 2008, an afternoon and evening devoted to musical entertainment. Gates open at the park’s multi-purpose space at 2 p. Read More! 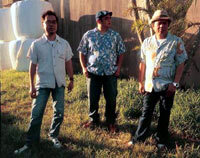 Nearly eight hours of smooth jazz is to be served up on Torii Beach over the July 4 holiday weekend as the Okinawa Jazz Association, Army Morale, Welfare and Recreation and the Army Air Force Exchange Service stage the Torii Beach Jazz & Wine Festival. The festival takes place Saturday, July 5, from 4 p. Read More! 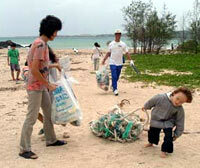 A Saturday beach cleaning is in the works for Southern Links Beach, and NPO Okinawa OCEAN is joining forces with Citigroup and the general public to participate in a third cleaning at the beach. The beach cleaning gets under way at 1 p. Read More!